For your own offers, once a visitor purchases or subscribes to your optin page, they normally then land on a thank you page that you control. 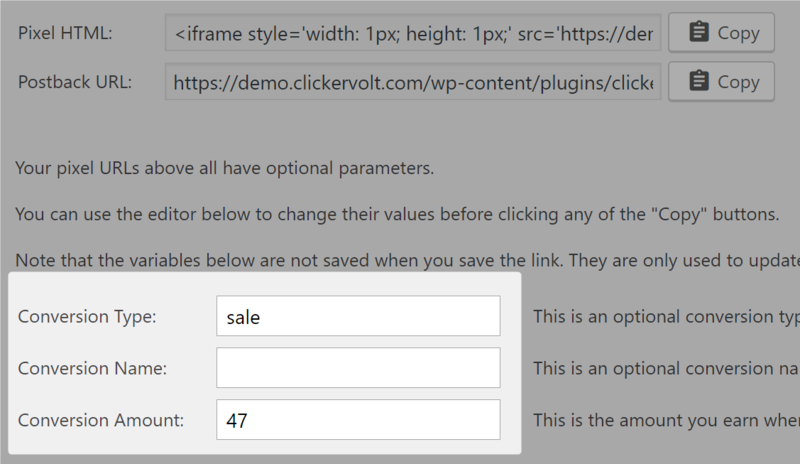 To let ClickerVolt track the conversion that just happened, you only need to paste a conversion pixel on that thank you page. The one you need to paste on your thank you page is the "Pixel HTML". That pixel is displayed in a 1x1 iframe, that will be invisible on the page. The slug's value is, as you have probably already guessed, the name of your link slug. This ensures that this conversion will not be tracked for another link view. The name parameter is optional, and is empty by default. This is an optional conversion name. It can be used for tracking transaction IDs. The amount parameter is also optional, and is empty by default. An empty value means a conversion amount of 0. If your product costs $99, you will set this to 99. Notice how "type" got the "sale" value, and how "amount" got 47 for its value.